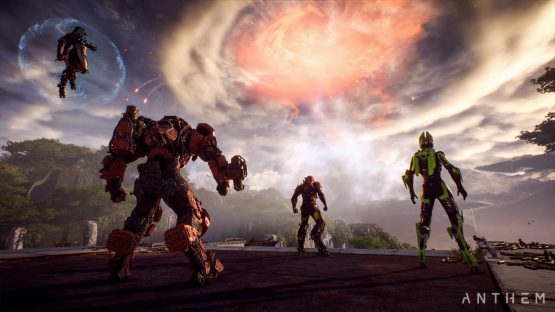 Like any game, Anthem at times has a few mechanics that are important to the game, but are not clearly explained. Sometimes, the simplest mechanics can be hard to figure out, even though they can be performed easily, and other times, they’re just flat out confusing! 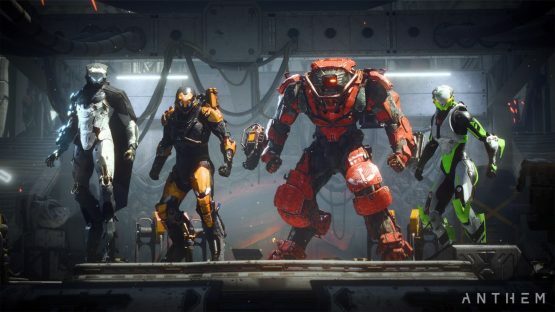 We have compiled an Anthem how to list that contains five game mechanics that we feel are essential, but are not well explained. As you level up your Freelancer, eventually you’re able to equip a second weapon to your Javelin. You can choose from things like a pistol, shotgun, light machine gun, and more. 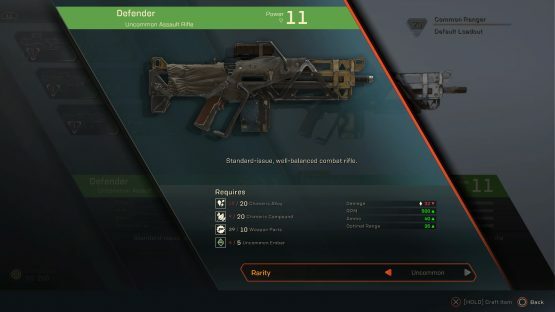 Once you’re in battle, you may want to switch between your assault rifle and shotgun or any other weapon combinations, but unfortunately, Anthem does not make it very clear how to do this. 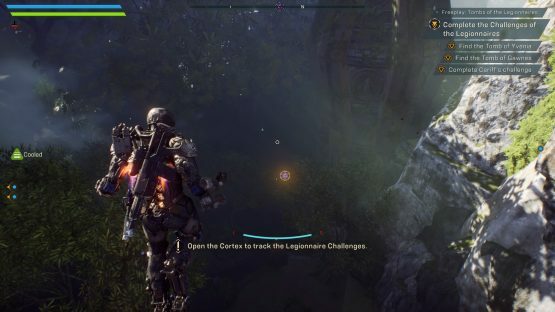 In order to switch weapons in Anthem, all that you need to do is hold down the square button. Now that you have this key information (thanks a lot, Bioware), get out there and fulfill some contracts! The short answer is, you have to level up. 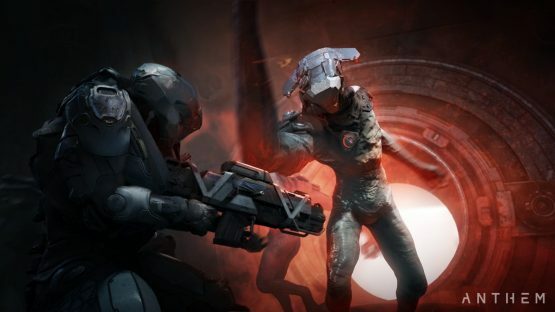 At the very beginning of Anthem, you are faced have to pick one of four Javelins. The choice can be a little bit daunting, because if you pick one that doesn’t match your style of play, you’re stuck with it for a little bit. However, if you made a bad choice, fear not, because the opportunity to choose your second Javelin class isn’t too far away. You are able to pick your first Javelin at level 2, and you can later pick another at levels 8, 16, and 26 until you have eventually unlocked them all! If you need help picking your first (or second, or third) Javelin, check out our Javelin classes guide! With any game that puts a big emphasis on exploration, crafting is going to be an essential mechanic too. 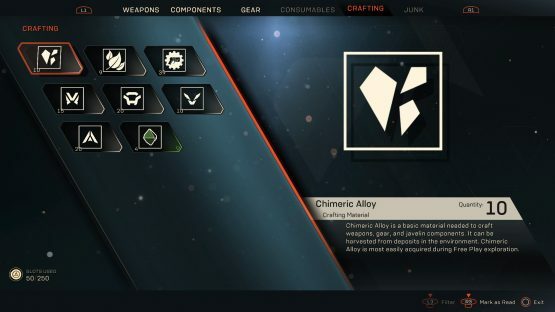 In Anthem, you can craft new weapons, gear, and components with items that you find while exploring. Collect things like ember, chimeric alloy, chimeric compound, and more by killing enemies, opening chests, exploring, and completing contracts. If you want to see your complete inventory of crafting items, you need to be at Fort Tarsus. Once you’re back at the fort, walk down the steps to where your suit is located and go right. There, you will see a shopkeeper who will show you all of your weapons, components, gear, consumables, junk, and crafting materials. If you want to actually craft things, you’ll need to be in the Forge. To do that, go to the machine to the right of the steps that lead up to your Javelin and click X. Once there, choose an item crafting category. If you want to craft a weapon, choose “weapons,” and pick either your primary or secondary weapon. Then, you’ll see all of your available weapons. Click R1 to move over to the crafting tab, where you can see all of your weapon blueprints. Choose whichever weapon you would like to craft, and you will see the materials that you need to craft it on the screen. If you have all the needed materials, hold X to craft it. If not, you’ll need to keep finishing contracts and exploring to find the rest of the necessary materials. You will also need weapon parts to craft various items. The best way to get those is to salvage old weapons that you no longer need, but they can also be found in piles of scrap and treasure chests. For example, if you have a Level 10 shotgun, you’re not going to use a Level 1 shotgun anymore, so you should salvage it. There are two ways to salvage an item. You can visit the shopkeeper mentioned above and choose whatever item you want to salvage, then hold square. You can also salvage items from the Forge by hovering over the item that you no longer want and holding the square button. In addition, salvaging items that are made with ember will add ember back into your crafting materials. So if you break down an uncommon shotgun, you will get back one uncommon ember that you can use for something else. Ember can also be found in the environment by harvesting minerals or plants, and by opening treasure chests. If you have gotten to the Tomb of the Legionnaires challenges, then you have undoubtedly tried to get multi-kills. According to BioWare, a multi-kill is defined as earning 8 kills in under 10 seconds. You must get the kills on your own and cannot have assistance from another player. This was never really made clear in the game and has caused players a lot of trouble. There are many different approaches to getting a multi-kill. I prefer doing World Events during Freeplay. To find a World Event, just fly around. Eventually, Owen will mention that someone needs help and a purplish indicator will show up on your map. If you focus on the indicator, you’ll join into the Event. During World Events, you’re pretty much defeating swarms of enemies, followed by what is usually a big boss. Thanks to a Reddit user, I believe that the best way to get a multi-kill in a World Event is to find the spawn point of enemies, then use your Ultimate. If you find the spawn point right before they spawn, simply wait for 5-6 enemies to come out, then hit them with your Ultimate. After that, you can shoot the rest of the stragglers nearby to get to get the other two or three kills. It may seem difficult, but I was able to get two multi-kills in one World Event using this method. So keep trying! Strongholds are unlocked naturally by playing through the Anthem story, with the first one being unlocked after the “Finding Old Friends” mission. Strongholds are advanced missions that are harder than your normal mission and cannot be done alone. The loot you get from a Stronghold is going to be better than what you would get from a contract, and the more advanced the Stronghold, the better the loot. There are six different levels of Strongholds ranging from Easy to Grandmaster 3. However, Grandmaster challenges will remain locked until you reach Level 30. 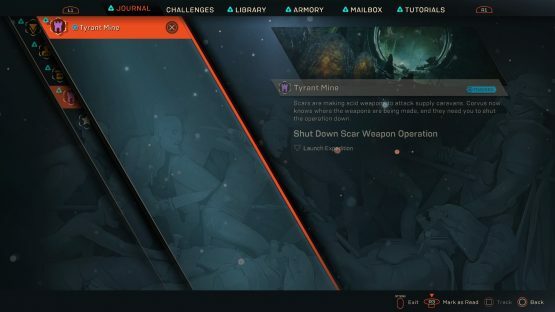 Hopefully, this Anthem how-to guide has been helpful and answered a couple of questions that you have about the game. If you have any further questions or need help, drop a comment below and we will do our best to answer it for you! From one Freelancer to another, keep up the good work.